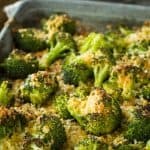 This quick and easy crispy cheesy broccoli gratin features crispy, caramelized broccoli florets topped with a panko cheddar Parmesan mixture that’s out of this world… Have it on your dinner table in under 20 minutes! If you’re in the mood for a quick and easy broccoli side dish, you’ve certainly come to the right place… We’re talking crispy, caramelized, even a little charred, broccoli florets (just the way I like them! ), topped with a panko cheddar parmesan mixture that’s out of this world. 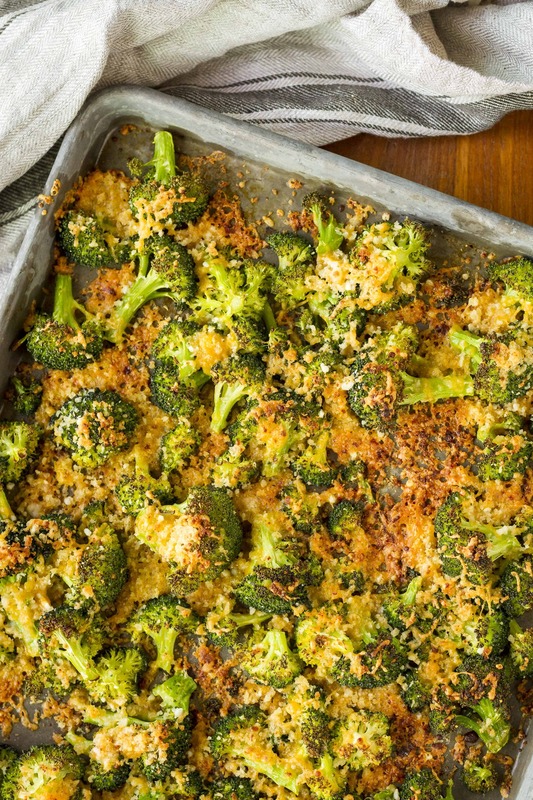 Baking this broccoli dish on a sheet pan means you get the maximum ratio of broccoli to crunchy coating. I seriously have to swat my kids away from the pan until dinner is served, because they’ll pick it clean before we even sit down. It’s like your favorite broccoli gratin on steroids, and it can be on your dinner table in under 20 minutes! I wish I could take credit for this delicious crispy cheesy broccoli gratin recipe, but it’s actually the brainchild of Raquel Pelzel. I found it in her recently released Sheet Pan Suppers Meatless cookbook. Actually, it’s just one of a number of recipes that I flagged to try — it just happens to be the first I’ve actually made. I’m very optimistic that the others will be just as good! I just love the small format of this cookbook. It has a soft cover and is slightly larger than a regular paperback, but not so large as a typical cookbook. I really wish all cookbooks had this option — it fits beautifully on a shelf. And it’s filled with gorgeous full color photos, as well as simple tips to help each dish turn out its very best. The truly brilliant method for the extra crispy broccoli in this recipe is preheating the sheet pan along with the oven. By dumping the prepped broccoli onto the hot sheet pan, you’re jump-starting the cooking process and decreasing the total roasting time. I simply cannot wait to try this with other veggies! After the broccoli roasts for about 15 minutes, you sprinkle it with a mixture of garlic, butter, cheddar cheese, and Parmesan. Pop it under the broiler for about 2 minutes until the cheese is melted and browned. You’re definitely going to want to scrape up all of those crispy, crunchy cheesy bits and serve them right along with the broccoli! Place a rimmed sheet pan on the middle rack of your oven and preheat to 400 degrees. Meanwhile, combine the butter and garlic in a ramekin and place it in the oven until the butter melts, about 5 minutes. Place the bread crumbs in a medium-size bowl, add the butter-garlic mixture, and toss with a fork. Add the cheddar and Parmesan cheese and toss to combine. 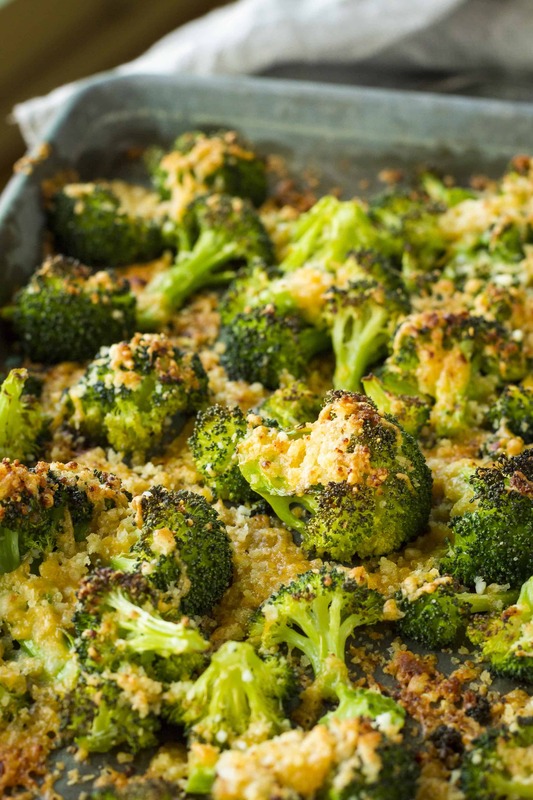 Remove the sheet pan from the oven and sprinkle the broccoli with the cheesy bread crumb mixture. Turn the broiler to high and place the sheet pan on the upper rack. Broil until the cheese is melted and browned, 1-2 minutes. Watch the bread crumbs closely, as broiler intensities vary and you don’t want them to burn! Remove from the oven, and transfer to a platter, making sure to scrape up all of the crispy, crunchy cheesy bits. Serve warm. Save yourself some prep time by using bagged, pre-cut broccoli florets to make this recipe even simpler! 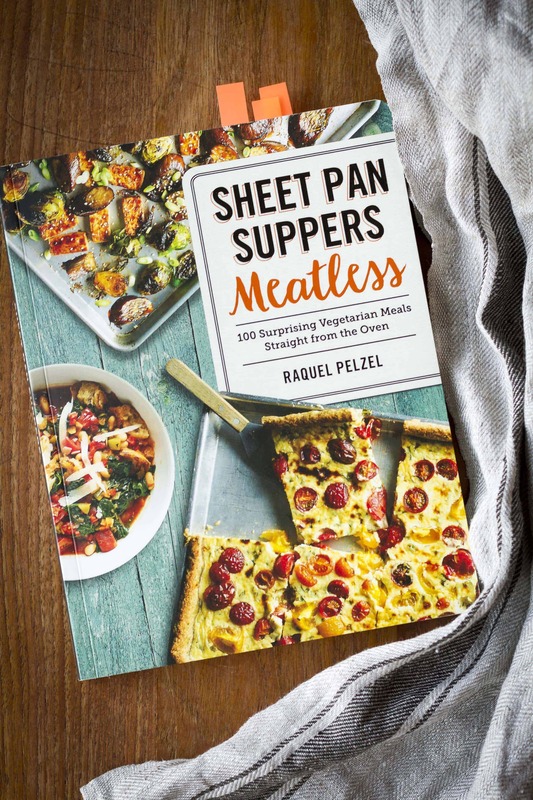 Sheet Pan Suppers Meatless is available in stores and at online retailers now. Pizza is the hit in my house! I have to say anything that consists of potatoes. We love a mix of sweet potatoes, squash, carrots and seasonings.